TV show dates: January 2, 2019 — present. Performers include: Nick Cannon (host); Ken Jeong, Jenny McCarthy, Nicole Scherzinger, and Robin Thicke (panelists). Based on the South Korean program King of Mask Singer, The Masked Singer TV series is a game show featuring competing, singing celebrities. 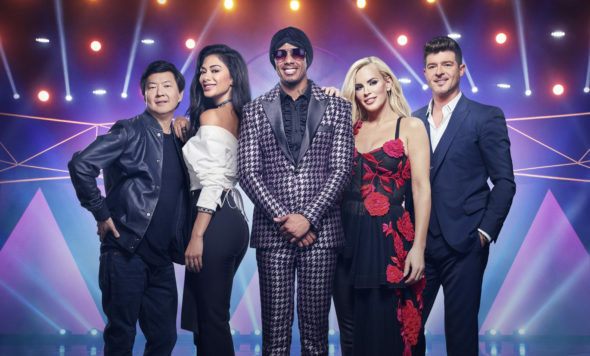 Nick Cannon hosts, with Jenny McCarthy, Nicole Scherzinger, Ken Jeong, and Robin Thicke serving as panelists. The celebrities go head to head in a singing competition, with a major twist: each performer is completely disguised in a fantastical costume, in order to conceal his or her identity. Sometimes, they drop hints about their identities and at other times, they try to throw off the panelists, as well as the studio and home audiences. Each week, after the elimination, the departing singer reveals just who was making music behind the mask. Celebrity singers include singers and musicians, athletes and more. What do you think? Do you like The Masked Singer TV series? Should this FOX TV show be cancelled or renewed for another season? The Masked Singer: Is the FOX TV Series Cancelled or Renewed for Season Two? Felicia Foster I REALLY LOVE THIS SHOW! THE MASKED SINGER IS FUN AND EXCITING! I HOPE THEY CAN KEEP FINDING PEOPLE TO BE ON THE SHOW! I really like this show. I think it would be amazing to see the Rabbit perform “Sound of Silence” in the arrangement used by Disturbed. this would completely throw the panel, and I am sure he could do it. I think it is stupid. The unicorn was horrible. Couldn’t keep Awake. The concept is just dumb. I like it. You can’t guess who they are. Ok people that soend there time watching TV 16 hours a day can. I agree its a joke. Would rather hear someone new with talwnt than somebody who already has it. How do know it was a joke if you didnt watch it? Leave the reviews for people who have actually watched the shows. I thought the show was great! LUV The Mask Singer Show!!!!!! It is so much Fun! LUV All Of The Judge’s… Nick Cannon is Amazing!!!! !